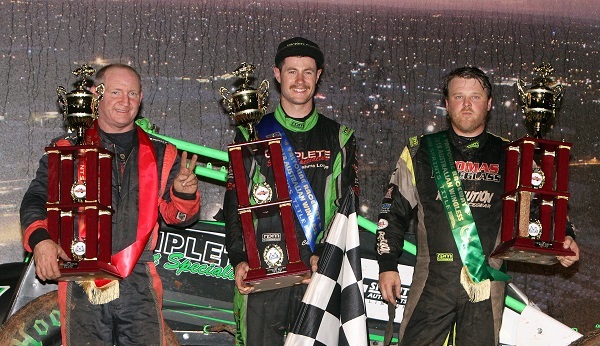 The top-three finishers in last month’s 2018 Australian Wingless Sprint Championship, which took place at Sydney’s Valvoline Raceway, have now been officially confirmed as they crossed the line, following the compulsory post-race engine checks. At the completion of the Australian Championship each season, the top-three drivers must undergo a mandatory engine inspection to confirm that their engine is in compliance with the rules and regulations of the Wingless Sprints class. With each driver having now passed their engine inspection, Joel Chadwick (SA), Mark Blyton (NSW) and Dean Thomas (NSW) are officially confirmed respectively as the first, second and third-place 2018 Australian Championship finishers. “We’re very pleased to be able to confirm all of the Australian Championship podium places and it caps off what was a fantastic running of the event,” stated Australian Wingless Sprint Racing President Mick Parry. “It’s an absolutely testament to the competitiveness of the Wingless Sprints class, with all drivers continuing to produce close and exciting racing, while all being on a level playing field. For further AWSR information, visit their website at www.awsr.com.au or LIKE them on Facebook or follow them on Instagram and Twitter by searching Australian Wingless Sprint Racing.